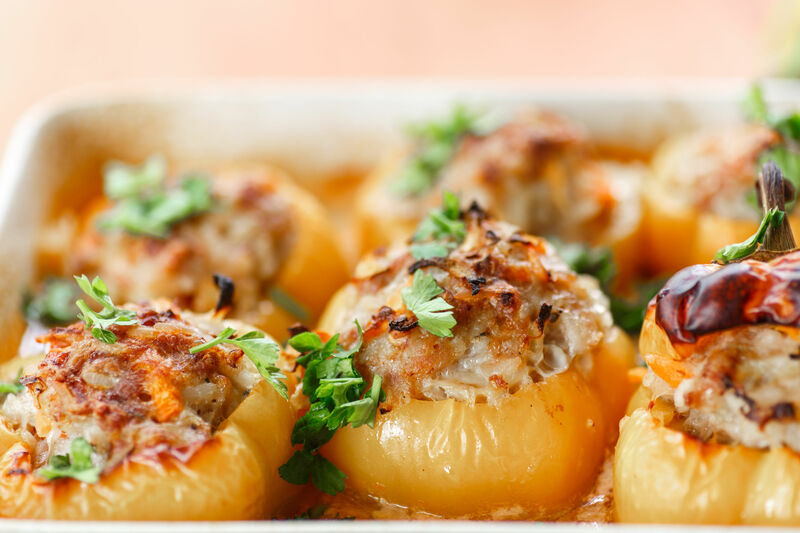 Stuffed With Goodness, Bell Peppers Never Looked This Good! Chicken is one of the most served dishes in our house, so people can sometimes get tired of it if we prepare it the same way too many times…thank goodness there are so many different ways to make it! When it comes to planning our dinners, we always forget about stuffed peppers as a filling, healthy option that most of our family loves. We’ve kept them vegetarian, filling them only with rice and other veggies, and we’ve stuffed them with beef, but we’ve never given chicken a time to shine in the peppers. We finally tried it out and can’t wait to try it again! We loved them, our kids loved them, and now we know we’ve got a solid standby to turn to in the middle of the week when our cooking inspiration leaves us high and dry – win-win-win! Melt butter in a medium saucepan over medium-high heat, then add carrot, celery and onion and cook until softened. 8-10 minutes. Add rice, then pour in chicken broth and bring up to a boil. Cook for 1 minute, then reduce heat to low, cover and let sit for 20-25 minutes, or until most of the liquid has absorbed. Stir cooked chicken into the rice and season generously with salt and pepper. Add garlic powder, basil and oregano, and mix everything together. Stuff hulled peppers with chicken and rice mixture, then spoon a 1-2 teaspoons marinara sauce on top. Sprinkle with cheddar cheese, then transfer peppers to a baking dish and bake for 35-40 minutes, or until tender. Remove from oven and let rest 5 minutes, then garnish with fresh parsley and serve hot.